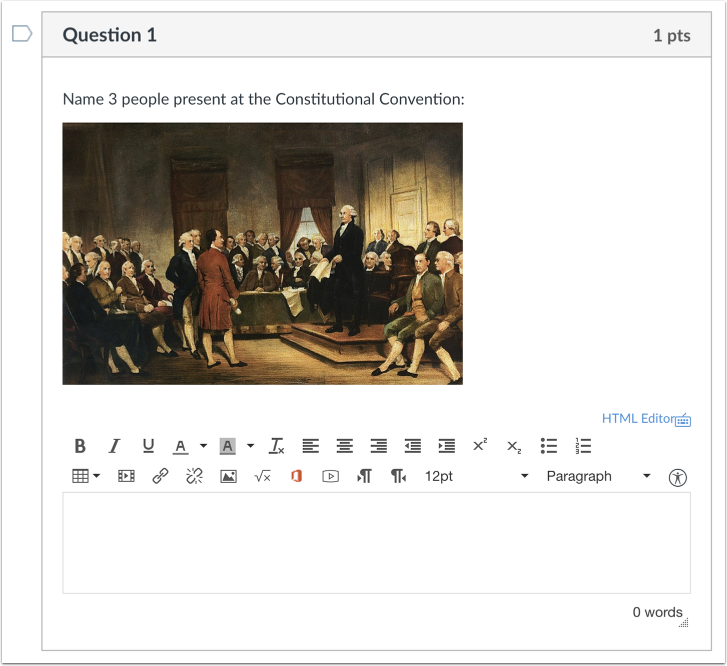 You can add files and images to your quiz questions by linking to your course content. You can also follow these steps to link course content in the quiz instructions. Click the Options icon of the quiz you want to edit . Click the Edit link . 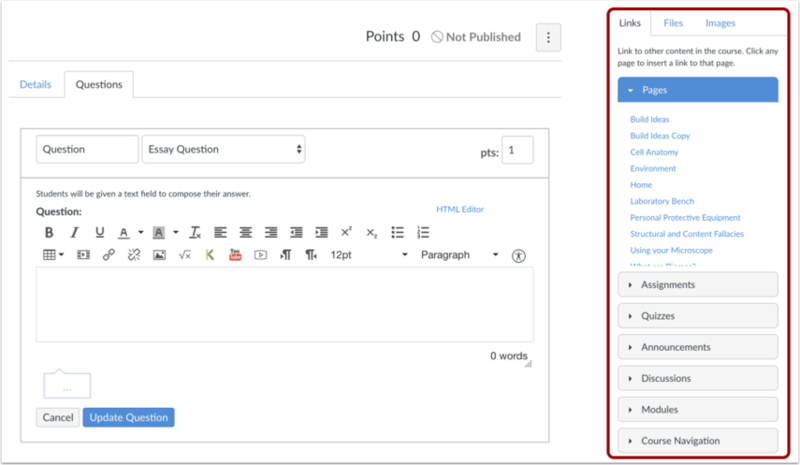 You will use the Rich Content Editor to link to content in your quiz question. If you want to add course content to your quiz question, you can access it in the content list on the sidebar. You can upload images and files from your desktop or link to images and files you have previously uploaded. The image will appear in your quiz question. You can add course images into your quiz questions. Place your cursor where you want to embed the image. Click the Images  tab in the Content Selector. 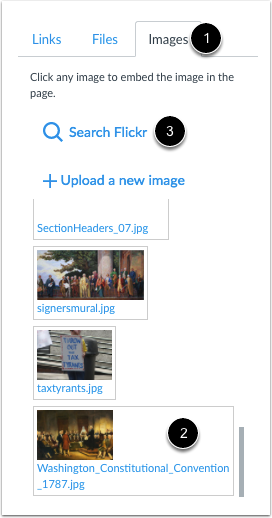 Search for the image  you want to add and click it to embed it in the Rich Content Editor. You can also upload a new image or find images on flickr . Click the Update Question button to see the question before it is published. 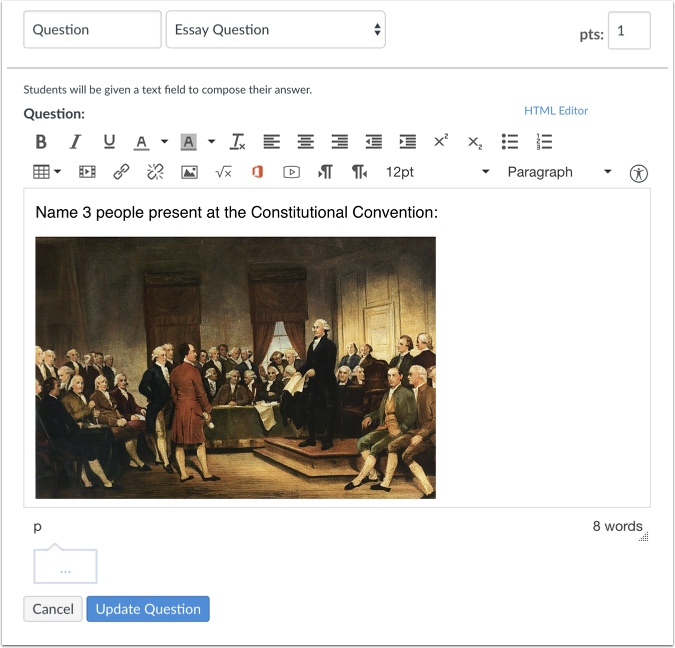 Click the Save button to save your work and preview the quiz. If you edited an existing quiz, any saved changes will automatically be updated. To preview the quiz, click the Preview button . If the preview shows the quiz the way you want it, click the Publish button . 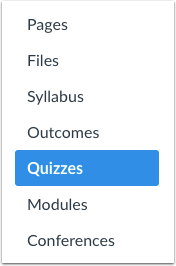 If you exit the quiz without saving, Canvas will ask you to save your changes when you return to the quiz. To update your changes, click the Save It Now button. This is what students will see when they take the quiz. Previous Topic:How do I create a Text (no question) quiz question? Next Topic:How do I create a question bank in a course? Table of Contents > Quizzes > How do I link course content to a quiz question?